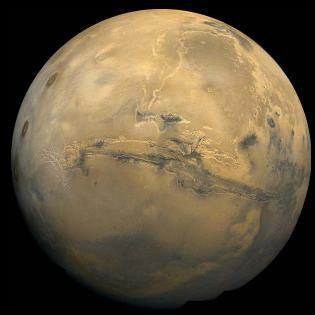 Could trips to Mars become a new rage for adventurous millionaires? While NASA is currently paying about $50 million per trip to send a person to the International Space Station (ISS), SpaceX CEO Elon Musk believes his company can offer Martian voyages for $500,000 per seat. The serial entrepreneur admits the first seats won't be selling for half a million, but he expects the target could be reached a decade after trips begin. “Land on Mars, a round-trip ticket — half a million dollars. It can be done,” he told the BBC. Musk did hint that one of the keys to low-cost trips to the red planet would be the ability to not only refuel there, but also to reuse the entire spacecraft on the return trip. In the BBC interview Musk said by reusing the spacecraft, you end up with the same sorts of costs airlines face. Musk compared it to flying today where a 747 isn’t simply thrown away after a flight to London. Like the airplane, the cost of the spacecraft could be spread out over numerous flights rather than just a single trip making fuel one of the main expenses rather than the entire ship.